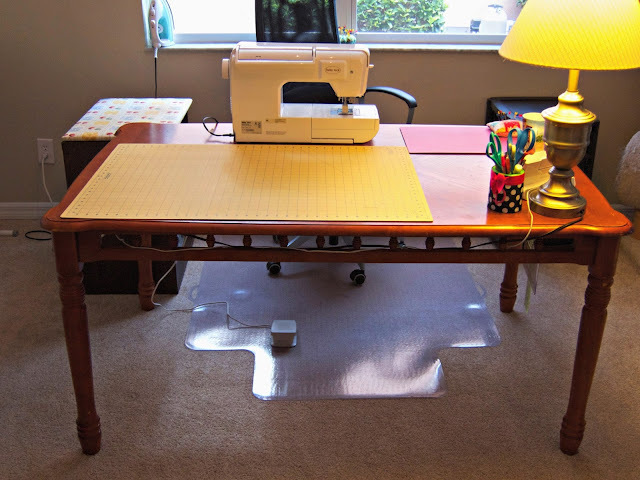 I made an earlier post about my initial sewing studio setup and wanting a few items to make it a more functional space. The big thing on the list was a cutting table. I'd checked at a few thrift shops, some garage sales, and lots of browsing on craigslist. I'd found a few tables that I'd really liked but either they sold too quickly or would not fit into our Prius V (our "big" car). I guess the saying that good things come to those who wait is true. I found a gem of a table for only $30 on craigslist this past weekend and picked it up Monday evening. It's 5 feet long so I really have a bit of room to spread out. I also love the small spindle detail around all the sides. I strung all of my cords through it and have a power strip attached to the one side so everything is neat and tidy. The little side table has my pressing board on it and keeps all of my thread, fabric scraps and sewing machine accessories close at hand. 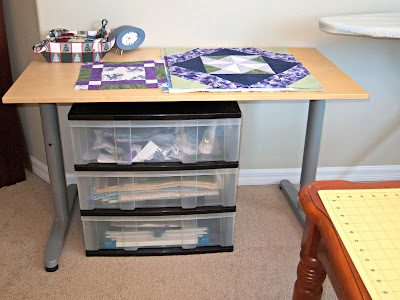 Here is the clever tip that I picked up from Karen at Sew Many Ways - I used an old belt hanger that was in my closet to hang up my quilt rulers! It hangs perfectly on the side of my new table! 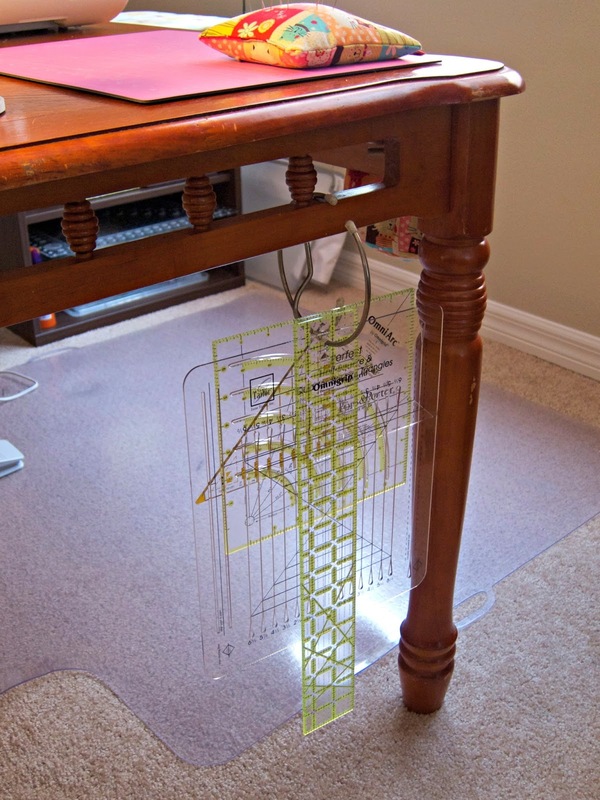 I now have the smaller desk over against the wall and can use it as a general work table. The plastic storage drawers beneath it house individual projects and their corresponding fabrics all together. Lastly is the bookcase opposite my sewing desk. I'm using it to store what little fabric stash I have. 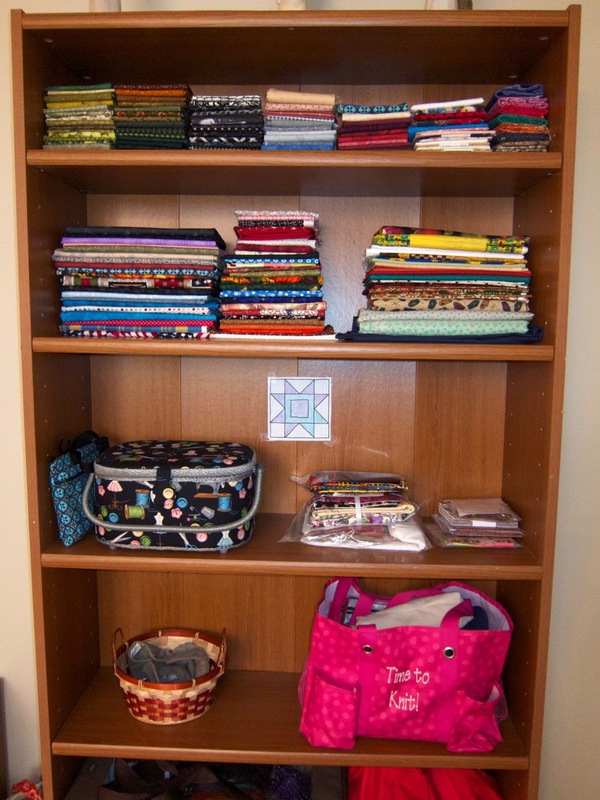 The top shelf is for fat quarters, the second shelf is for larger yardage, and the middle shelf has my sewing basket and quilt kits. The bottom two shelves (one isn't shown) are storing my yarn and knitting supplies. I'm really pleased with how things are coming together and I look forward to sewing in my new space!